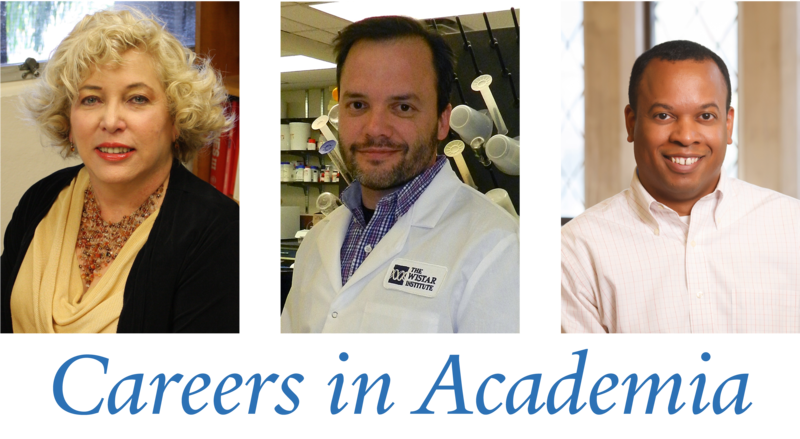 During this conversation, scientists in research and teaching careers discussed their experiences and paths to careers in academia; share their successes and challenges; insights into their day-to-day; and advice to graduate students interested in pursuing academic careers. Dr. Luis Montaner was born and raised in San Juan, Puerto Rico. He attended Kansas State University, where he received a B.S. in 1989 and his D.V.M., M.Sc. in 1991. Dr. Montaner was awarded a Marshall Scholarship in 1992 leading to completion of his additional research doctoral training at the Sir William Dunn School of Pathology, University of Oxford, UK in 1995. He has been appointed at the Wistar Institute since 1995. He directs multi-institutional and multi-investigator clinical studies with a basic research component and was recently awarded a $23 million Martin Delaney Collaboratory grant from NIH to advance the HIV cure research agenda. Dr. Montaner is Director of the HIV-1 Immunopathogenesis Laboratory and has enjoyed an active research partnership with community health center Philadelphia FIGHT for more than 20 years. He currently serves as Editor-in-Chief of the Journal of Leukocyte Biology, with an editorial staff of over 60 investigators and 800 submissions per year. In December 2014, Dr. Montaner was awarded the Herbert Kean, MD Family Professorship, which recognizes high-risk, high-reward research. His research is primarily focused on innate effectors, immune regulation of infection, activation measurements on ART, and translational human immunology-based studies. Dr. Montaner currently serves as a faculty development mentor to faculty at the University of Puerto Rico (since 2005), University of Pennsylvania (since 2010) as well as added faculty nationally. Dr. Montaner has received numerous distinctions for his work on behalf of people living with HIV/AIDS, including the Jonathan Lax Award from Philadelphia FIGHT, the Founders’ Award from the AIDS Fund of Philadelphia, a Recognition and Honors Resolution from the Philadelphia City Council, the Penn Center for AIDS Research (CFAR) Community Advisory Board Red Ribbon Award for Medical Research, and the Doctors of Distinction for Medical Research Award from the Philadelphia Business Journal. Dr. Montaner and his team are currently enrolling participants in the largest HIV Cure research clinical trial to date. Dr. Adelfa E. Serrano is a Professor of Molecular Parasitology in the Department of Microbiology and Medical Zoology of the University of Puerto Rico School of Medicine. She has studied malaria for nearly 30 years, working towards the understanding of parasite drug resistance, parasite development in both the vertebrate and mosquito hosts, and more recently in drug discovery and testing. She received a Bachelor’s of Science degree and Master of Science, both in Biology from the University of Puerto Rico Río Piedras, working in bilharzia. In 1987, she received a PhD from the University of Georgia, Athens, where she characterized cellular immune responses during Schistosoma mansoni infections and vaccines. Dr. Serrano did her post-doctoral research training at the Harvard School of Public Health, in the Department of Tropical Public Health, specializing in the molecular biology of the malaria parasite, focusing in the mechanisms of multidrug resistance and the molecular diagnosis of malaria. In 1991, Dr. Serrano joined the Department of Microbiology and Medical Zoology at the UPR School of Medicine where she has maintained an active research laboratory funded by the NIH, other agencies, private industry, and various foundations. The current focus of her research involves the parasite’s ATP Binding Cassette transporters and the molecular pathways of glutathione metabolism, including the genes and their potential role in malaria drug resistance and parasite development in the vertebrate and mosquito hosts, as well as identification and validation of potential targets for therapeutic interventions. She has maintained productive collaborations with Johns Hopkins University, Leiden University, Sanofi Genzyme, The Broad Institute, and Harvard University. She has also successfully coordinated and managed the AIDS and Infectious Diseases Facility and currently serves as Activity Director for The Infectious and Global Diseases Program of the Research Centers for Minority Institutions grant at the UPR Medical Sciences Campus. Dr. Omar Quintero is an Assistant Professor of Biology at the University of Richmond in Virginia. He obtained his PhD in Cell Biology from Duke University where it was the support of his graduate advisor, Dr. Jo Rae Wright, that helped him to develop his interests in combining research and undergraduate education. In fact it was Dr. Wright who encouraged Omar to pursue a postdoc with a teaching focus, like the NIH-funded IRACDA (Institutional Research and Academic Career Development Awards) programs. Omar joined the IRACDA/SPIRE (Seeding Postdoctoral Innovators in Research & Education) program at UNC for his postdoc. He met his SPIRE postdoctoral advisor, Dr. Richard Cheney, during a summer at the Physiology Course at the Marine Biological Laboratory at Woods Hole, where he found his love of imaging and the cytoskeleton. As a SPIRE postdoc, Omar cloned and characterized a novel myosin, MYO19 that is involved in transport and localization of mitochondria (this remains the focus of his research program). Following his time in SPIRE, he joined the faculty at Franklin & Marshall College as a Visiting Assistant Professor, and then the Department of Biological Sciences at Mount Holyoke College as a tenure-track Assistant Professor. Sensing that his long-term goals might be better suited at other institutions, Omar left Mount Holyoke for a position at the Penn State College of Medicine with Dr. Christopher Yengo to gain expertise in biochemistry and biophysics. While there he continued to refine what his professional goals would be, and search for the sort of institution that would match them. In 2012 he found the right spot when he joined the Biology Department at the University of Richmond, a department and institution with a focus on evidence-based, progressive pedagogies that promote equity and inclusion in biology education and research. In addition to his work at Richmond, Omar remains involved with his field through his work on the American Society for Cell Biology (ASCB) Education Committee, the Coalition for Life Sciences (grass roots science advocacy), and the ASAPBio movement (accelerating scientific communication through pre-print servers).